Coffee is by far the largest export product of Uganda, accounting for 20% of export revenues. With approx. 1.3 million households, Uganda has the largest number of coffee farming families in the world. Despite favorable agro-climatic conditions for its production and a constant global increase in demand for the product, those smallholder coffee farmers still operate at a very low productivity. The reasons for this are varied, such as a lack of reliable access to agronomic skills, inputs, finance and markets. The farmers as well as Ugandan exporter Ibero are falling far short of their possible potential. Therefore, NKG BLOOM was initiated by importer Bernhard Rothfos and Ugandan exporter Ibero, both members of Hamburg based Neumann Kaffee Gruppe. They established a network of partner companies in order to create NKG BLOOM, a sustainable sourcing strategy. At the heart of NKG BLOOM is the set up of a fully fledged Farmer Financing Unit within the Ibero operation. 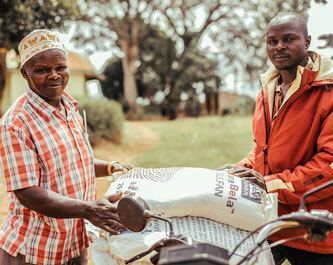 This unit provides fertilizer and cash advances to farmers, as part of a 2-year crop-nutrition program that should increase farm-level productivity by at least 75% after 2 years. Moreover, Ibero is setting up, through a complex and innovative set of partnerships, an ecosystem of support to farmers that includes agronomy and financial literacy trainings. For Ibero, this is a business opportunity and not just a CSR initiative. The idea is to be able to grow its sourcing capacity and ultimately its business competitiveness hand in hand with the growth of farmers. 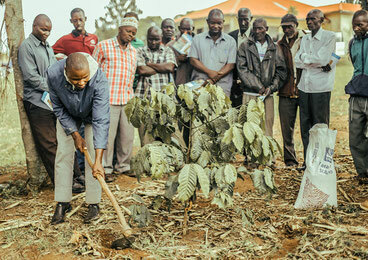 In Uganda, smallholder coffee farmers from several coffee regions are organized in 82 Depot Committees (DC's), which are registered companies with up to 800 farmers and so-called Producer Organizations, a group of up to 30 farmers. All DC's are organized by the Coffee Farmer Alliance (UCFA). In January 2017, NKG BLOOM has started and has already disbursed fertilizers to 493 farmers at 7 Depot Committees. Today, the average Ugandan farmer produces only 550 kg of green coffee per ha, in one main crop and one fly crop, while its counterpart in Vietnam yields on average 2.500 kg per ha. But Demo-plots of HRNS in Uganda prove, that the average yield of the Ugandan farmer could increase up to 1.625 per ha within only two years. What the Ugandan farmer needs is basically fertilizer and cash (besides agronomic training). A 2 year crop nutrition program cycle is the starting point for Ibero Uganda and all partners to improve the smallholder coffee farmers' livelihoods and to establish the sustainable sourcing strategy in Uganda. Every farmer has to meet specific eligibility criteria and to complete an application process before he is getting two guaranteed fertilizer and cash (mobile money) disbursements. After every two disbursements, the farmer has to fully repay the disbursements by bringing coffee to exporter Ibero Uganda. The farmer cannot reapply for the next two disbursements before the repayment is fully done. Genza Simon is 27 years old and supports a family of 7 persons. He owns 500 coffee trees on an area of 1.5 acres and had never used fertilizer before he started participating in NKG BLOOM nine months ago. After his successful application he received a fertilizer advance of 100 g per tree in March and 100 g per tree in August. Now it is main coffee harvest season and he estimates that his coffee production per tree has tripled from 2 kg to 6 kg. That is a 200% increase in less than a year - we are impressed! Rajab Kiwanuka has participated in NKG BLOOM for the last two seasons and has already sold 17.087kgs of kiboko (dried coffee cherries) to the DC. By now, he has borrowed 500kgs of CAN and 500kgs of NPK fertilizer for his farm measuring 10 acres as well as approx. $600 in cash. We are looking forward to see more farms bloom and farmers smile like Rajab! Do you want to know more about the latest progress at NKG BLOOM? "NKG BLOOM is not just another CSR project to include in a company´s annual report. It´s about transforming the heart of the coffee sourcing business in a manner that holds the potential to lift thousands of smallholder farmers out of poverty." "The most satisfying feeling is to see the look of gratitude in the eyes of a farmer in whose life you have made a positive impact. That is what is happening with NKG BLOOM. The first batch of farmers have started seeing good results on their gardens and over 92% of them have already paid off all or half of their advances and have come for the second batch." "NKG BLOOM Project is providing smallholder farmers a key service that most financial institutions have to date not been able to offer effectively. Access to financial services is critical for farmers to invest in production and to break out of the vicious cycle of dependency towards middlemen."